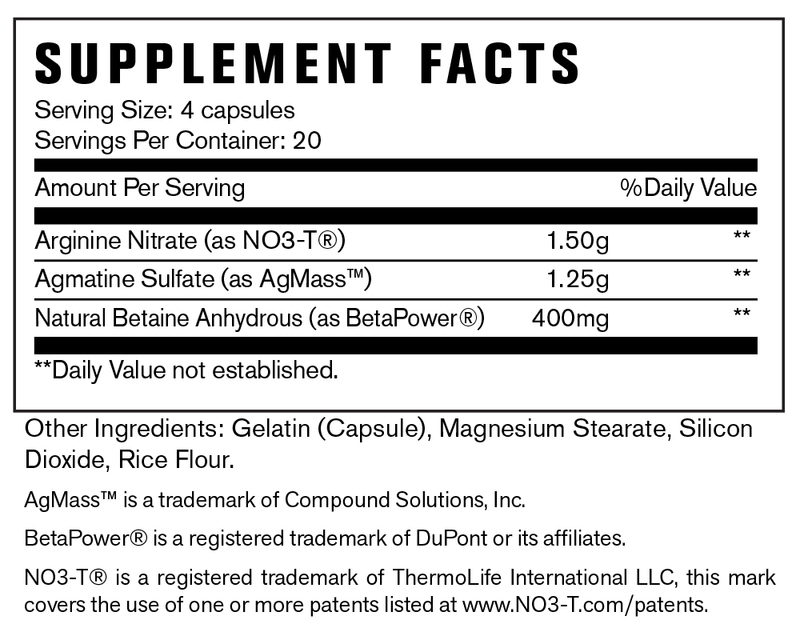 Harness the power of nitrates with this powerful, capsule-convenient, nitrate-based, stimulant-free, pre-workout supplement utilizing popular ingredients such as Agmatine Sulfate, L-Arginine Nitrate (NO3-T® Technology) and BetaPower®. And since it’s stimulant-free, you can still crush those late night training sessions without the fear of a sleepless night due to excessive stimulants. SUGGESTED USE: As a dietary supplement, take 4 capsules once per day, 1 hour prior to training. WARNING: This product is only intended for healthy adults, 18 years of age or older. Keep out of reach of children. Please consult your physician before taking if you have any pre-existing medical conditions or are taking any medication. Do not use if you are pregnant or nursing. Do not take if you are currently taking nitrates for chest pain or erectile dysfunction medication. Contains 1.5g of nitrates per serving. Use 8 weeks on and 3 weeks off. Do not exceed 3 grams of nitrate-based compounds per day. Discontinue use and consult your health care professional if you experience any adverse reaction to this product. Store in a cool, dry place. ALLERGY INFORMATION: Manufactured in a facility that processes milk, eggs, shellfish, tree nuts, peanuts, wheat, and soy.